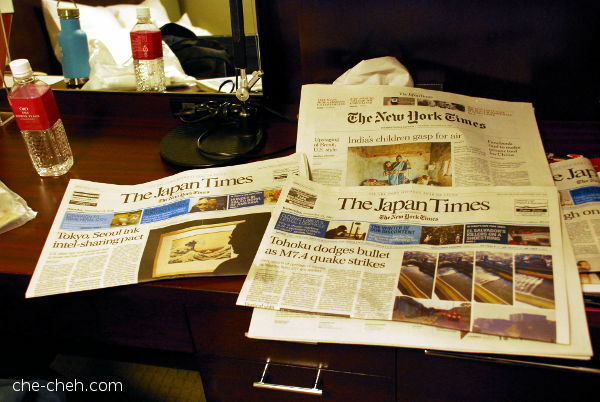 Newspaper headlines during our stay in Osaka. Checking out from Ana Crowne Plaza was lightning fast. 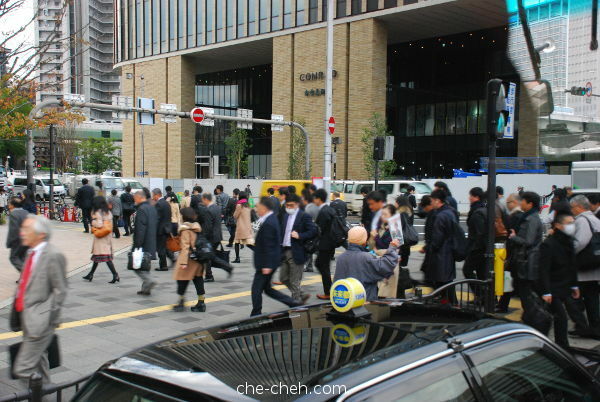 Then we took the free shuttle to Osaka Station at 8.30am. It’s back to work day, so yeah… people sea! 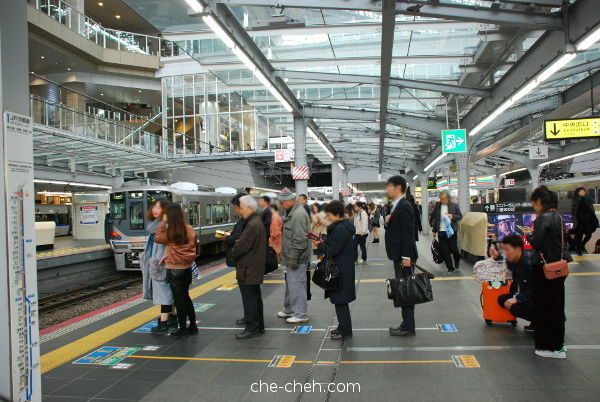 At Osaka Station, I wasn’t really sure about the ticket gate for Special Rapid train to Kyoto so I asked a staff. 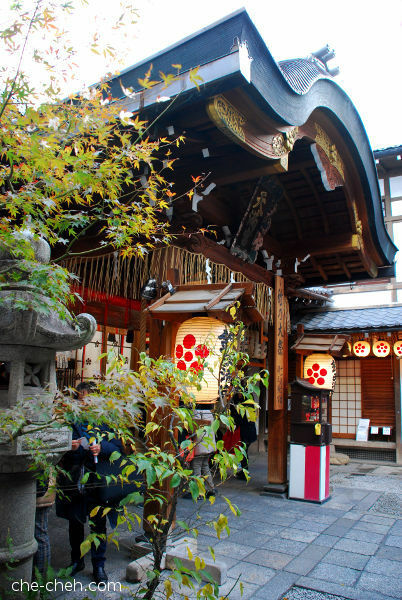 The reason for the blurriness was because I didn’t check the place out in advance and neither did I buy train tickets to Kyoto in advance. Reason was because there are plenty of trains to Kyoto daily, so there’s no rushing or fear of running out of seat… unless you’re visiting during major holidays eg. golden week. There were a lot of huffing and puffing when carrying our luggage up the staircase to the train platform. After all that, we realized there’s an elevator. Argghh! Waiting at track 8 for our 9.16am JR Special Rapid Service train which will take 30 minutes to Kyoto and cost 560 yen. We paid the fare using ICOCA card. 33 minutes later… here we are at track 2, Kyoto Station. 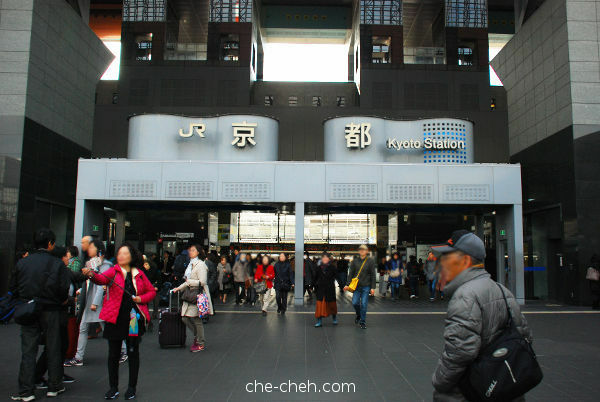 Main entrance of Kyoto Station. Lots of people no doubt. 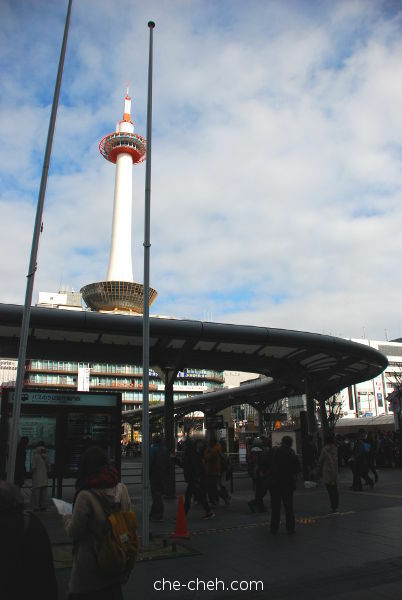 Kyoto Tower seen from Kyoto Station. Our initial plan was to take city bus to hostel. Since our luggage were really heavy, we grabbed a taxi instead. Taxi from Kyoto Station to Len Kyoto Kawaramachi (our hostel) cost 830 yen. Divide by four of us, it’s only 207.5 yen pax. By bus, it’ll be 230 yen pax. Yup, some savings if you travel in group plus more comfortable ride. We have two large luggage and one medium luggage and they fit perfectly in the boot (was a little worry they wouldn’t fit). The taxi driver didn’t know where our hostel is, so he stopped and checked his mobile phone and GPRS. I also showed him the location with a map. It was quite a bit of chicken and duck talk. Only after he knew the exact location, did he start the fare meter. And despite not knowing the location, he accepted us without any doubt. He was the best taxi driver I’ve met to date! Since it’s wasn’t time to check-in our hostel (4pm! ), we head out for lunch. 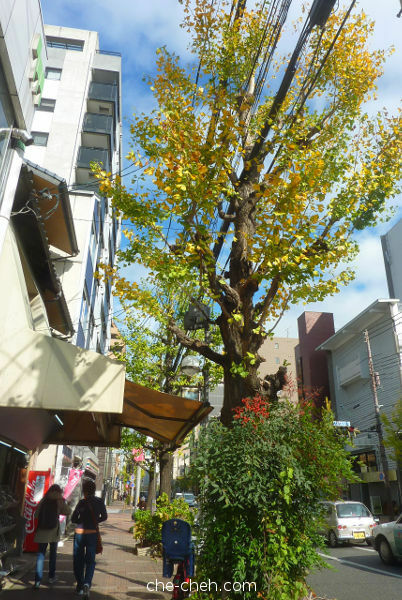 Those are giant ginkgo trees lining Kawaramachi dori. 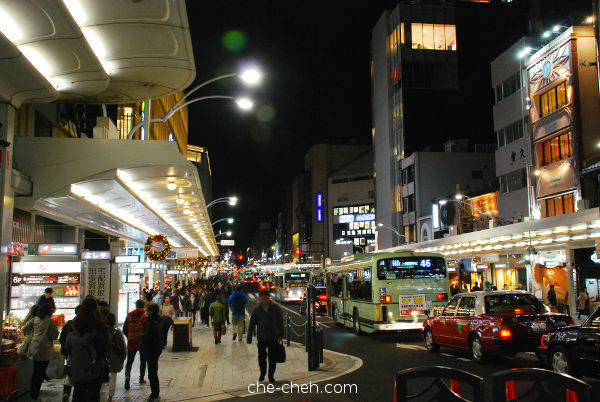 Shijo dori, a busy and famous street. After half and hour of walking we arrived at Gogyo Kyoto for a very special ramen lunch. They serve burnt ramen! Click the link to read my review. After lunch, it was just 10 seconds (yup!) 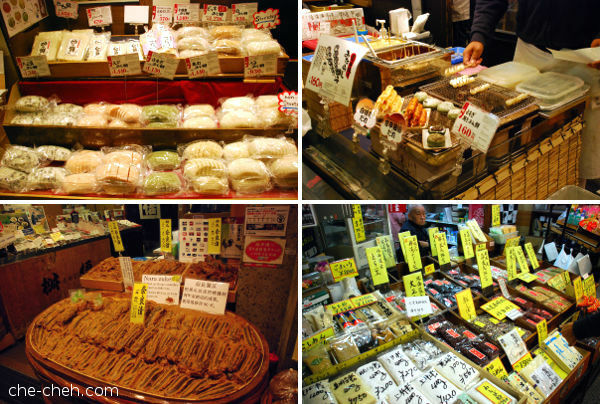 walk to Nishiki Market 錦市場 (Nishiki Ichiba). 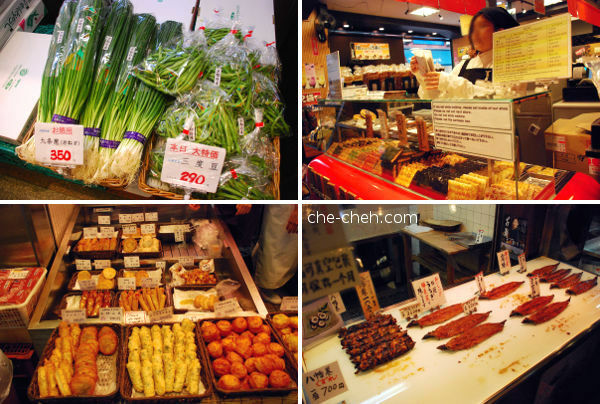 It’s a very famous market with lots of things to see, buy and eat. The market is covered so anytime is a good time to visit. 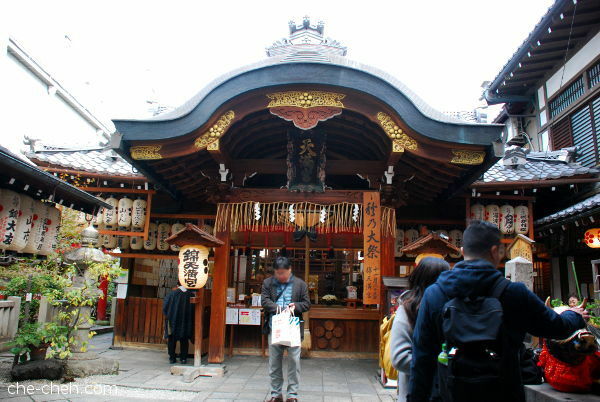 Also the market is several blocks straight line long so it’s easy to know your bearing unlike Kuromon Market at Osaka. 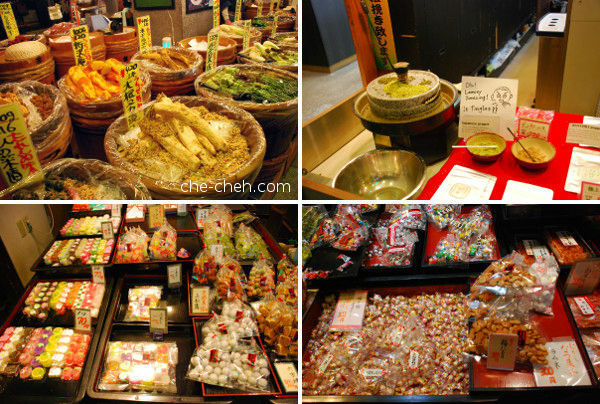 Clockwise from top left: Various types of pickles (tsukemono), Japanese pepper powder, sweets and more sweets. Yatsuhashi 八ツ橋 @ 270 yen per packet (after tax) from Marushige まるしげ shop. 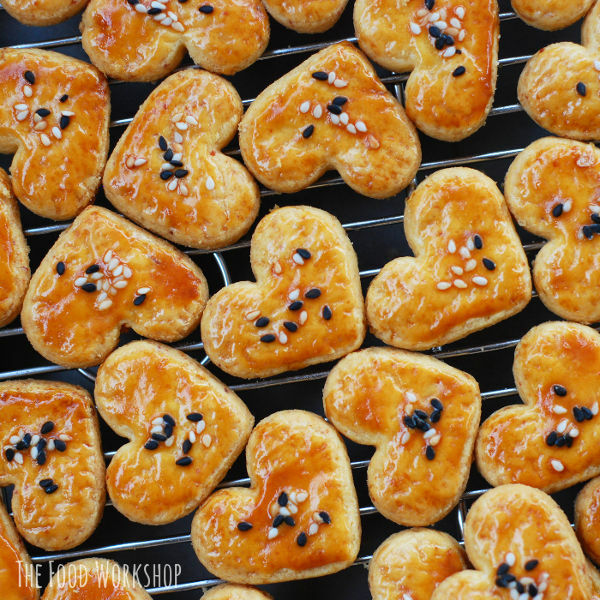 It’s a sweet traditional snack from Kyoto. I find this better tasting than the one from Kiyomizu-dera. 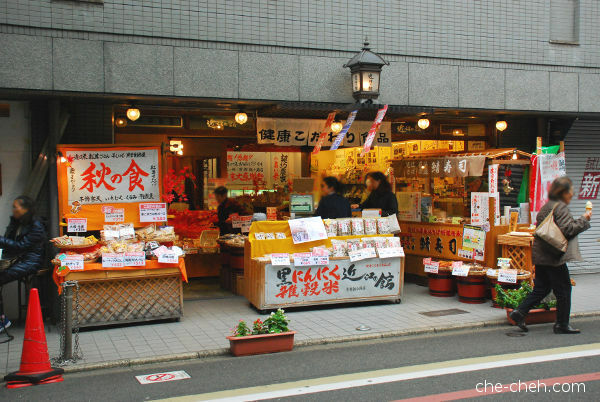 I chanced upon this shop called Oumi no Yakata 近江の館 just outside of Nishiki Market which sells many types of beans, beans powder and traditional food. I bought a packet of black bean kinako powder from them. Have yet to open it. 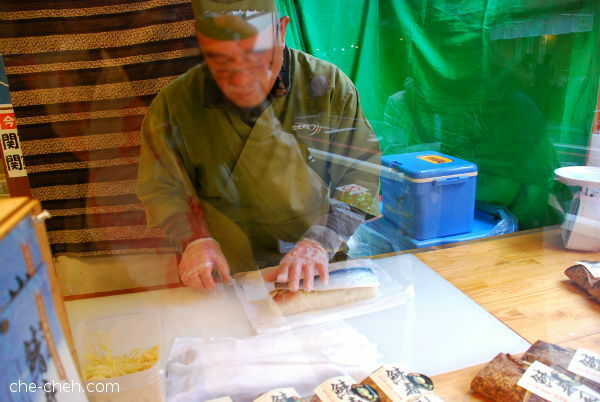 This man is making mackerel sushi or saba zushi 鯖寿司 in Japanese at Oumi no Yakata. Did not get any (on a budget) and quite regretted it. Next to Oumi no Yakata is this shop called Konnamonja こんなもんじゃ that sells soy milk doughnuts, soy milk and various kinds of nuts. 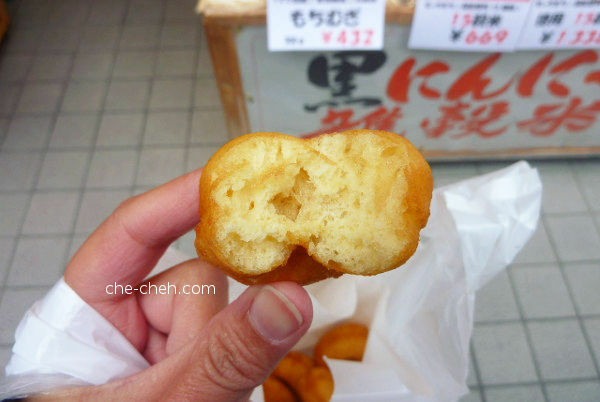 We got a bag of 10 mini soy milk doughnuts for 300 yen. 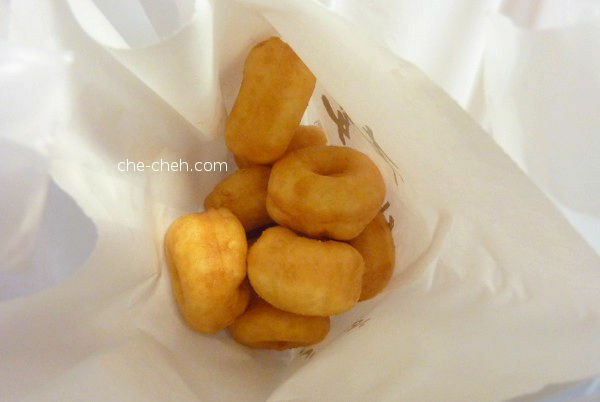 The doughnuts are very tender and yummy but I wasn’t really in the mood to eat non-Japanese food. 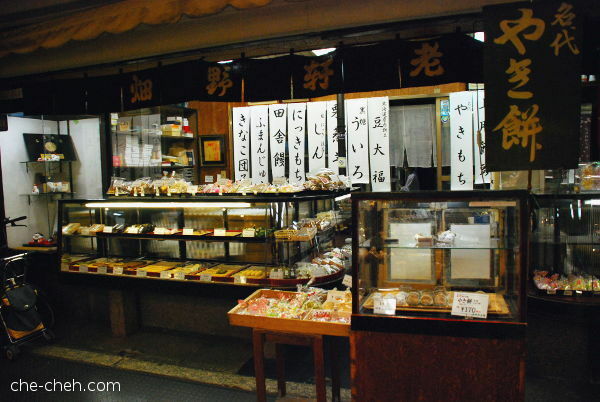 We saw this traditional wagashi shop called Hatano Kenrouho 畑野軒老舗 at Nishiki Market. Matcha dango @ 180 yen (left) and mugwort mochi @ 170 yen from Hatano Kenrouho. 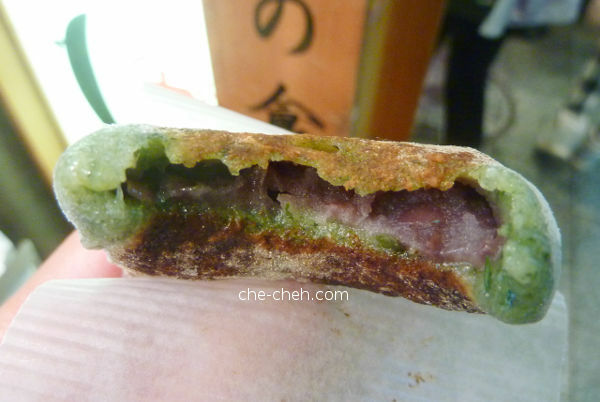 Red bean filling inside mugwort mochi. Yum! Clockwise from top left: fresh vegetables (they are expensive no doubt but the quality is ‘cheng’), rice crackers at Mochiyaki 寺子屋本舗, grilled unagi and fish cakes. 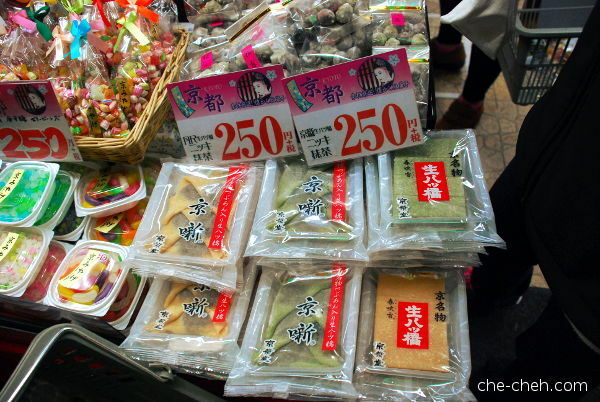 Clockwise from top left: uncooked mochi (rice cakes), mitarashi dango, bean flours! and pickled large cucumber. 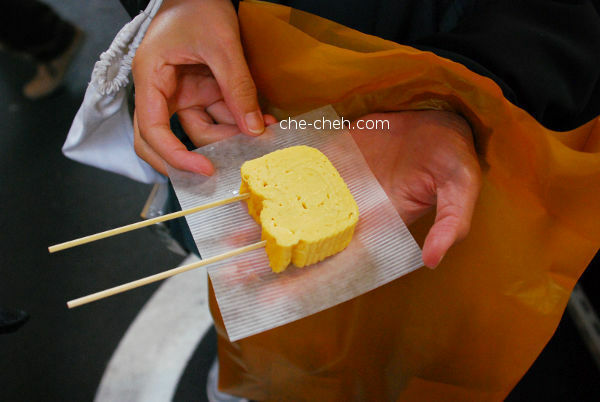 Egg roll from Tanaka Keiran 田中鶏卵. Egg roll stick @ 120 yen from Tanaka Keiran. It’s a masterpiece art of layering! Taste awesome too. 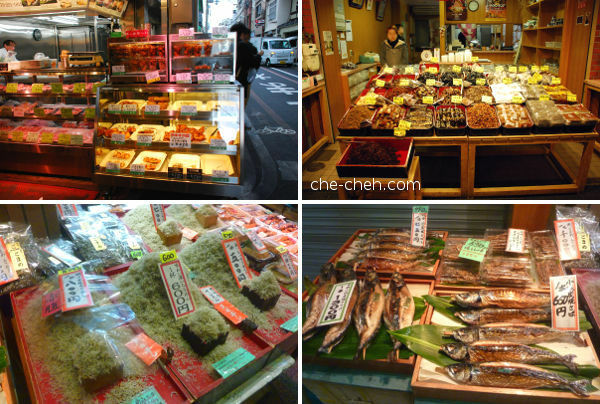 Clockwise from top left: raw chicken + fried chicken, tsukudani, grilled fishes and baby anchovies. Japanese tea by Yamadashiya やまだしや. 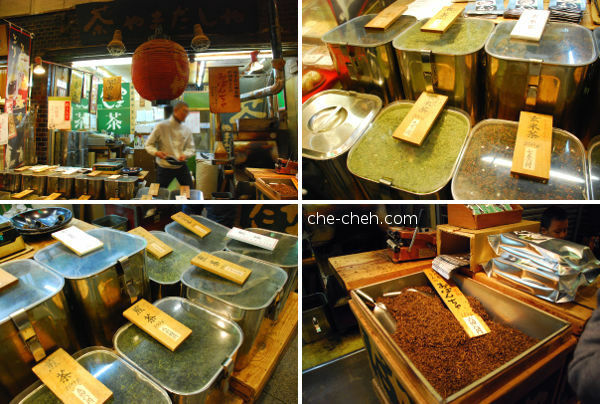 I bought hojicha from them; 100g for 648 yen (the one at bottom right). 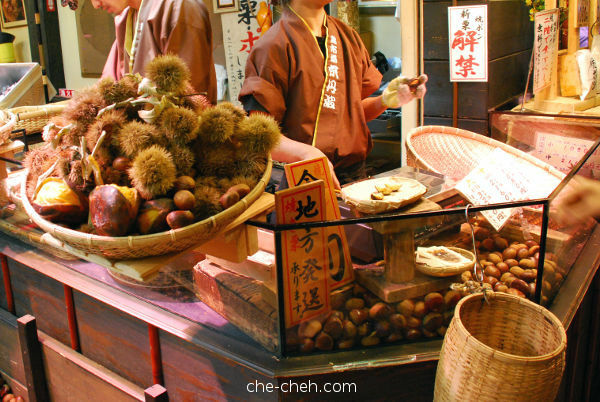 Lots of chestnut from Kyotamba 京丹波. They were expensive alright (small: 1080 yen, medium: 2160 yen, large: 3240 yen) but my sis bought it and so I get to try them. The quality is a little better than normal. They also give out free chestnut for testing. 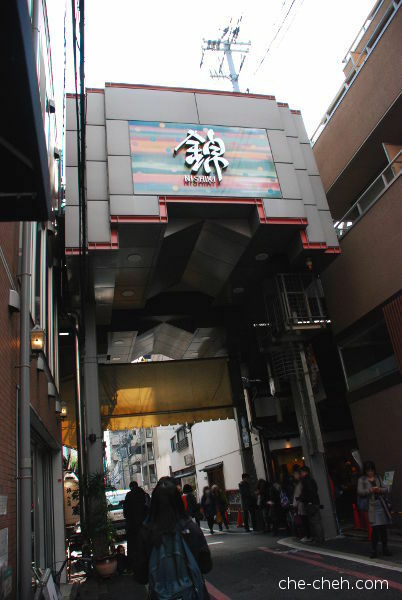 At the very beginning/end of Nishiki Market, sandwiched between two shops is Nishiki Tenman-gū Shrine. It’s a small shrine and there were not many people there when I visited. 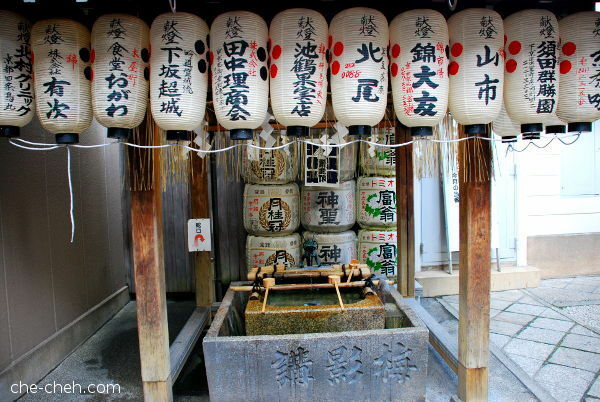 A temizuya 手水舎 (water purification basin). 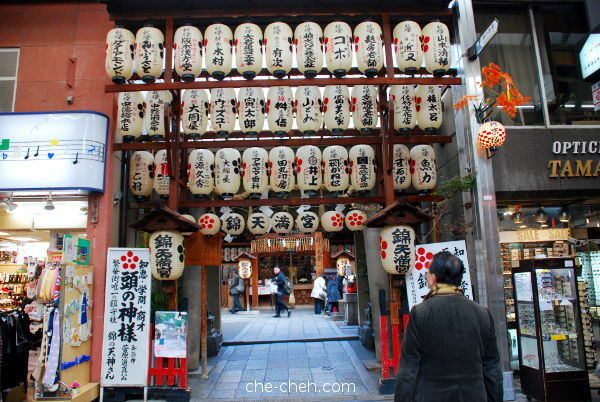 Love the lanterns and sake barrels. We saw people rubbing the cow’s head and we follow suit. Must be good luck. 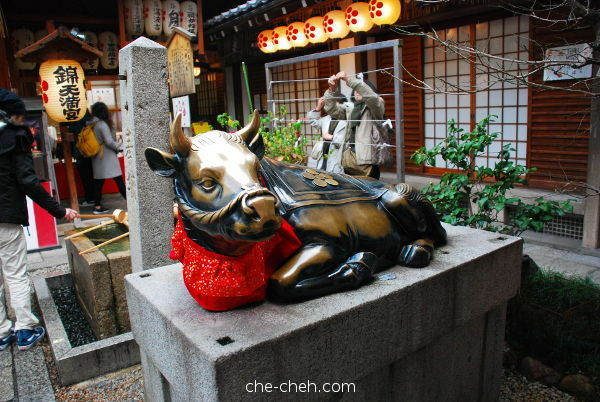 There’s another water basin behind the cow. I’m not sure of the purpose. After spending 2.5 hours at Nishiki Market, we walked back to our hostel to proceed with the check-in. 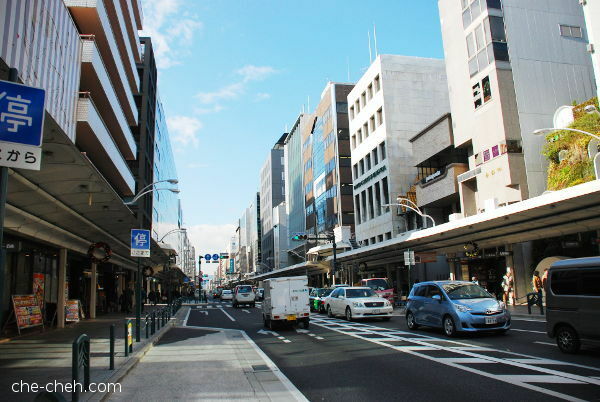 We stayed at Len Kyoto Kawaramachi for 4 nights. 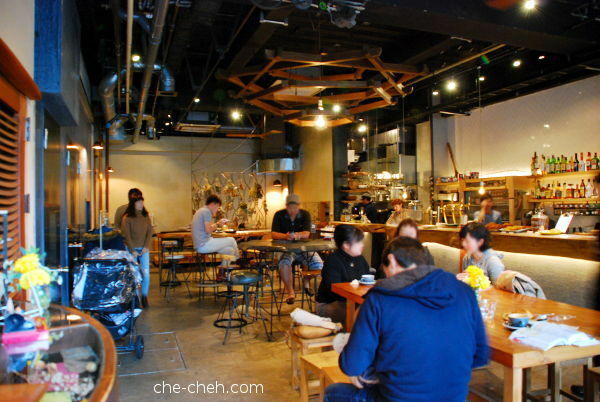 It’s a hostel, cafe, bar and restaurant. The ground floor or for Japanese it’s the first floor is the cafe, bar and dining area. The atmosphere is pretty relaxing every time I passed by. There’s an elevator at the left end (where you see a couple standing) which will bring you up. The 2nd floor is the common room while 3rd to 5th floor are hostel rooms of various types. 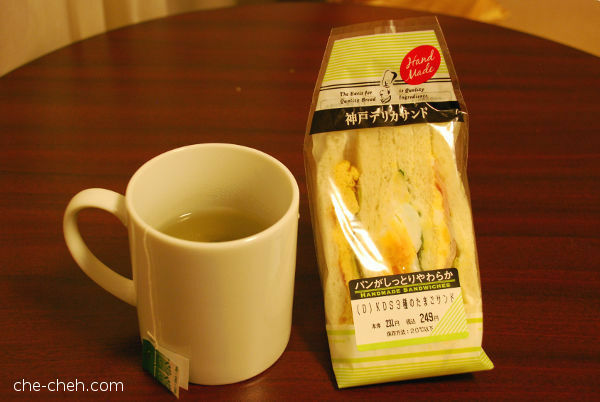 Several convenient stores (7-11, Daily Yamazaki) are nearby which mean it’s easy to get anything you want. Len is situated at quite a strategic location. 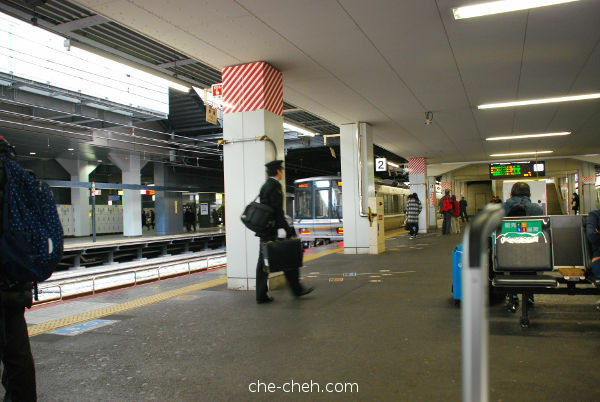 The only time we took public transport and taxi is when going to/fro Arashiyama and Kyoto Station. The rest? We walk and walk and walk. 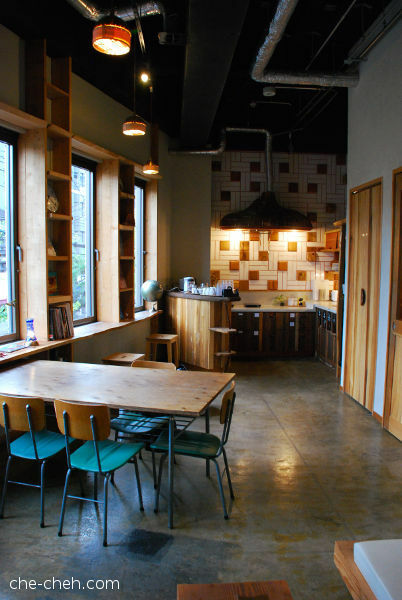 Queen double room @ 8400 yen~9400 yen per night. 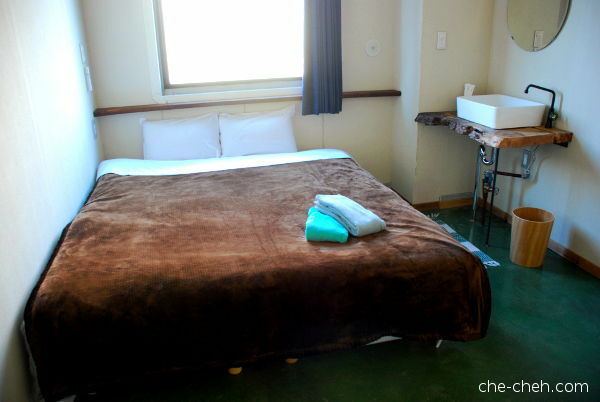 The room is quite spacious with large bed, sink, mirror and bin. It’s supposed to be sis and my room but we traded with our senior mates since they don’t suit the twin room. I’ll tell you why in awhile. 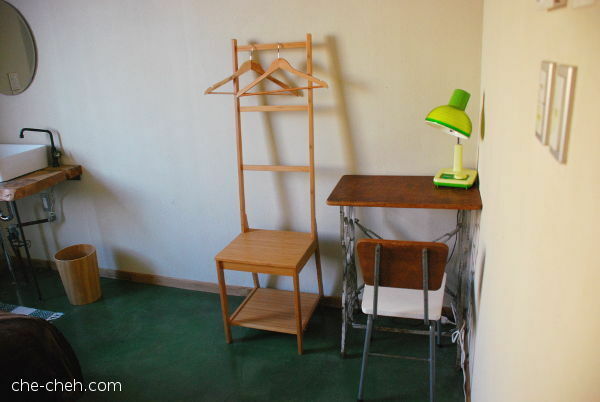 There’s a small are to hang clothes (which is not enough), table, chair and lamp. 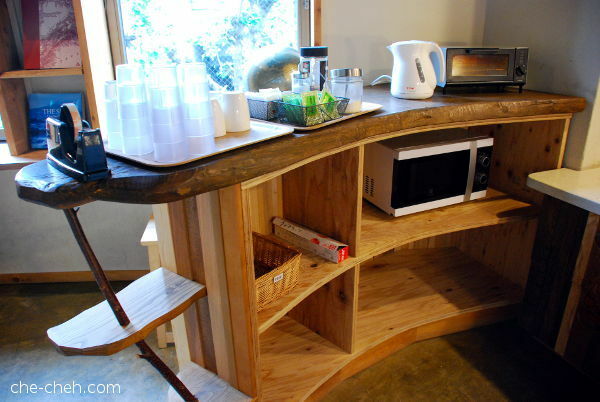 I love the rustic furniture but I wish there are more stuff to aid our stay. 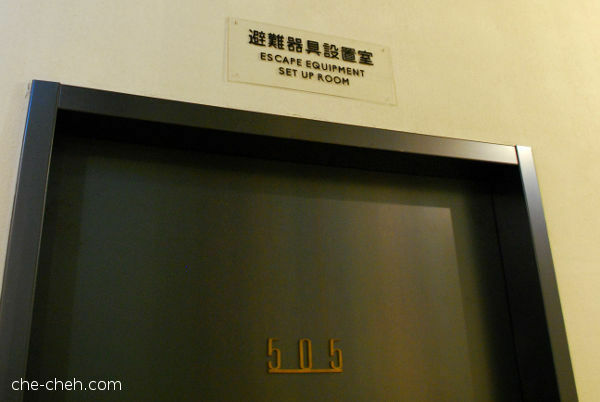 “Escape equipment set up room” ?? Our twin room was so tiny @ 6800-8400 yen per night. This room is more suitable as a single room. There’s a table, chair, lamp, bin and a larger place for hanging clothes (far right) compared to the queen room. Because the placement of the ladder for the bunk bed are too high up (around knee high), sis and me slept together at the bottom bunk throughout our 4 nights. Thankfully the bed is quite wide. Oh btw, upon arrival we all need to make our own bed (queen double room as well). That means fitting the pillowcase into the pillow and comforter sheet to the comforter. We arrived here tired and they want us to make our own bed. Adui. Also since it was so hard to climb up the top bunk what more making our own bed… even more reason to just sleep on the lower bunk. Now you know why we traded room with our senior mates. Thankfully the mattress are really comfy. This is the escape equipment. In case of fire, come to this room #505 and you can use the rope to escape. The placement of this escape equipment makes the room even smaller and restricted. 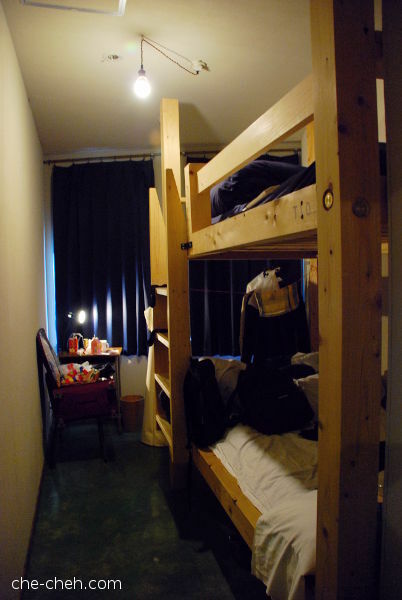 This twin room cost 6800 yen~7400 yen per night. If I have known all these inconveniences ahead of time, I wouldn’t have book this room. Double room looks so much better. 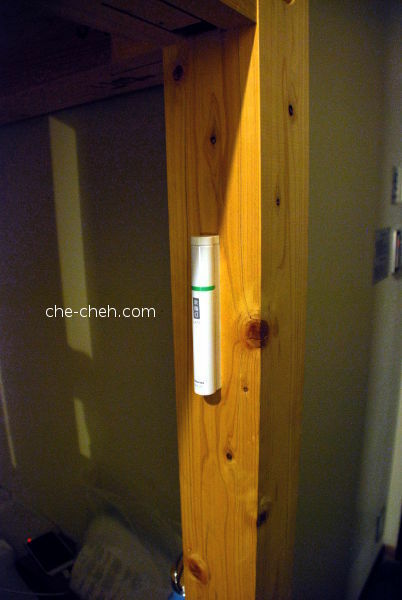 A LED torchlight is provided for the lower bunk… which is quite a joke. Give a proper night light please. 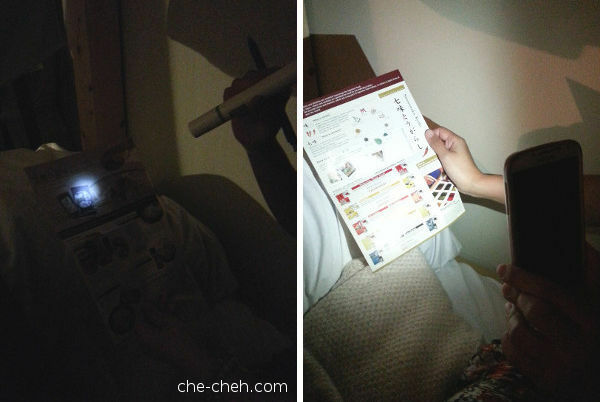 Using the torchlight, we couldn’t read a single thing at night and have to rely on our mobile phone’s light. You know, sometimes you just want to stay in bed and read the brochures you’ve gotten during your visit to a certain temples or maybe reading maps? The room’s yellow light is also quite dim. There are free wifi and electrical sockets for both rooms. Bathrooms and showers are shared and available on each floor. They are really clean but they’ve only got cold water from the tap so it was really cold when you’re washing your hand during autumn/winter time. Talking about cold, well the corridors, elevator and bathrooms/showers area are SUPER COLD. There are no heater and you will shiver like crazy. 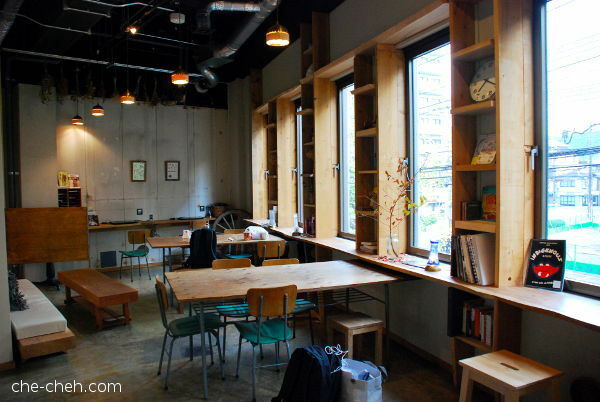 Then when you go to the lounge area or the cafe/bar/dining area, it’s warm and cozy. I don’t understand this arrangement. 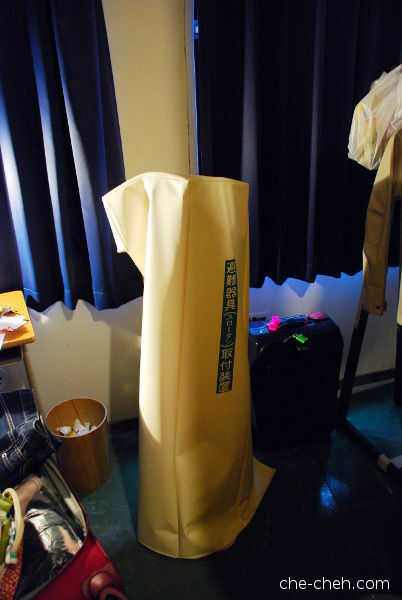 The room’s door are quite heavy and so whenever anyone open or close the door, we can hear it. Also we can hear people talking, footsteps and noises from the bathroom/shower. 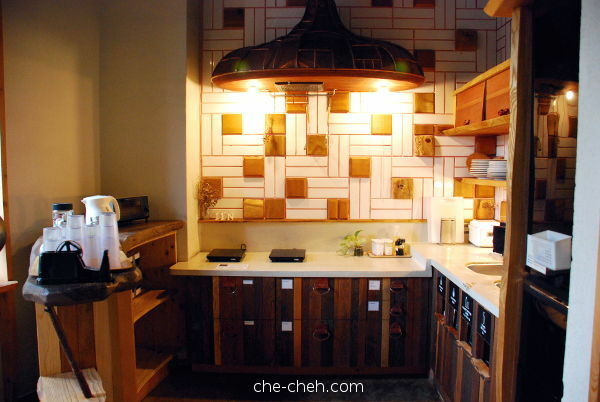 All these we don’t mind as most hostels we encountered are like this (though one shouldn’t set this as a bar. It’s a major hospitality no-no). 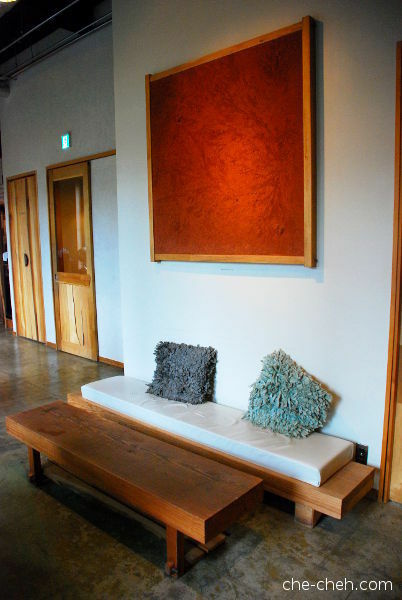 Now this is my favorite part of Len… the lounge area which looks 100x more comfy than my twin room. I love having my meals here. Far end is the PC area. At the other end is the kitchen area with a door on the right opening to the washing machine/dryer. There are induction cooker, rice cooker, plates and utensils. I like that food waste are segregated accordingly. On the right of this photo in black is the fridge where you can store your yummy food. There are cups, toaster and microwave. Coffee and tea are complimentary. I wish there were more than one kettle. 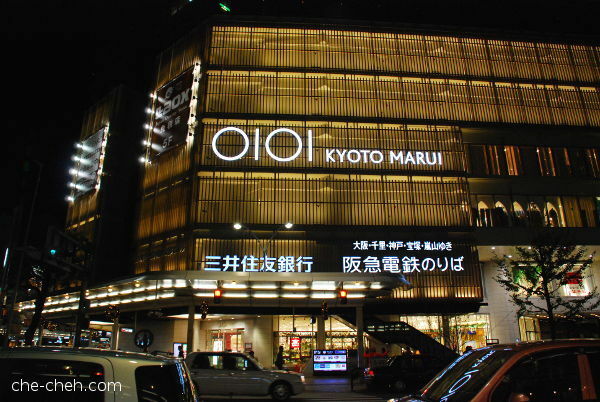 All in all, my stay at Len Kyoto Kawaramachi was a mixed bag. I would come back again, sure but no more twin room for me and also the corridors, elevator and bathroom/shower area must be heated. After resting for quite some time, we head out for dinner around after 6pm. 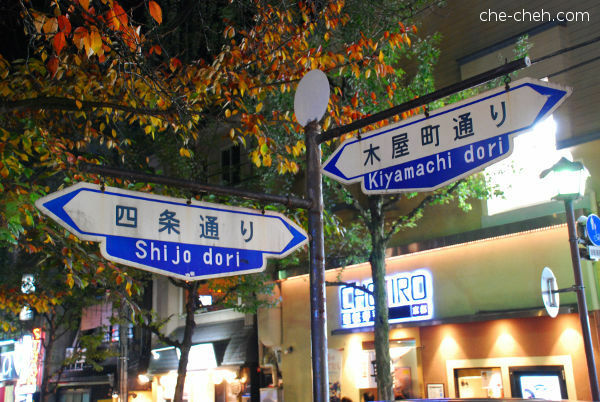 Kiyamachi dori where there are many restaurants but funny not many people walking by. We continued on towards our dinner place. We had dinner at Ootoya which serves teishoku (Japanese set meal). Click the link to see what we ordered. 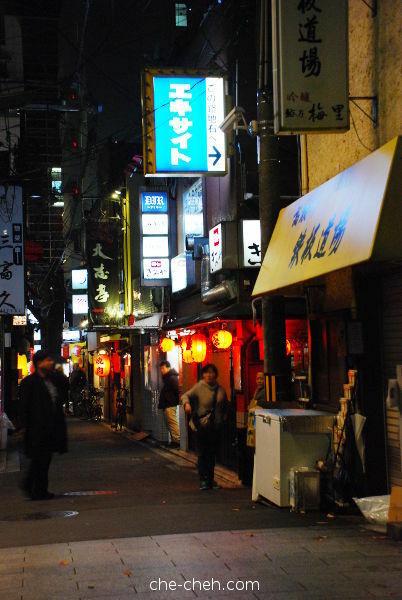 After dinner, we explored Pontocho Alley. 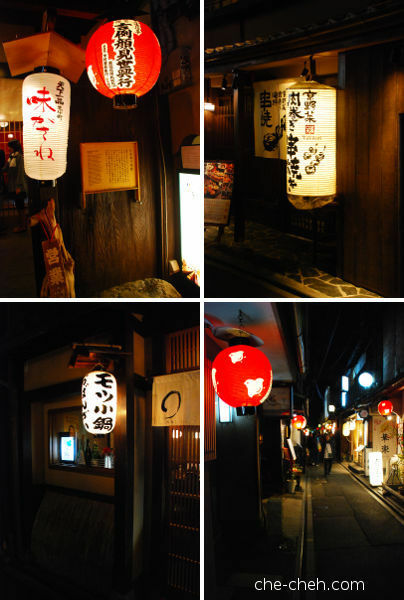 It was a lovely walk with beautiful lanterns lighting the way. The restaurants here are more upscale. We bought takoyaki on the way @ 300 yen for 4 pieces but gah it cannot be compared to Osaka’s takoyaki. And yes, it’s more expensive too. We then stopped by Yoshiya x Calbee collab store that sells Calbee (of course), Meiji, Glico, Kit Kat and many more. 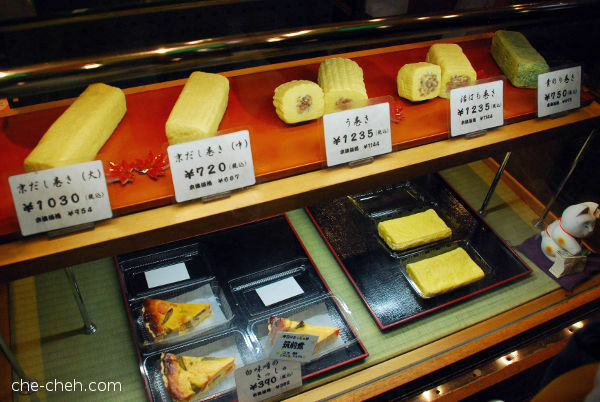 The store: Okashi no depāto Yoshiya (Shijo Kawaramachi branch) お菓子のデパート よしや (四条河原町店) is located beside exit 1B of Kawaramachi Station/the building next to Kyoto Marui. We dropped by Daily Yamazaki to get our breakfast for tomorrow on the way back to hostel. Slept really late… 12.15am. Stay tuned for day 5 where you’ll be bombarded with tonnes of photos. What? You have to make your own bed??!! And there is no hot water? I don’t think I wanna stay in such a place unless no choice. Haha! Hi Foongpc, this was a case of not much choice as I planned the trip in less than 6 months. Those good places have been snapped up beforehand.